Histories of the National Mall | Work Begins on the Smithsonian "Castle"
Work Begins on the Smithsonian "Castle"
“Work Begins on the Smithsonian "Castle",” Histories of the National Mall, accessed April 23, 2019, http://mallhistory.org/items/show/194. 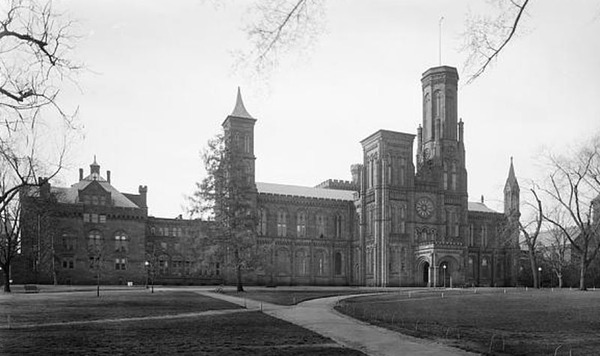 James Renwick, Jr began work on the original Smithsonian Institution building in 1847. Renwick's design was inspired by western European structures originally built in the 1100s, making this Gothic Revival building look like a castle. When construction began, the Mall was quiet and the Smithsonian building was isolated from the city Washington. When it opened in 1855, the Castle housed the first museum on the Mall.